Saturday January 22nd 1881 I was busy about the work a good part of the day but got a little sewing done. Winnie was over part of the day and Mollie Templin called in the afternoon and she was telling us that Mr Boye at Mt Vernon was dead. John went to the store for the first time this week. I did not feel very well and went to bed early. Sunday 23rd 1881 We had not finished the morning work when Uncle Georges folks came along to go up to Wolfs to make a visit Ella and I got the dinner over and Rob and I took a sleigh ride going down to Uncle Jims. In the evening we went to church. 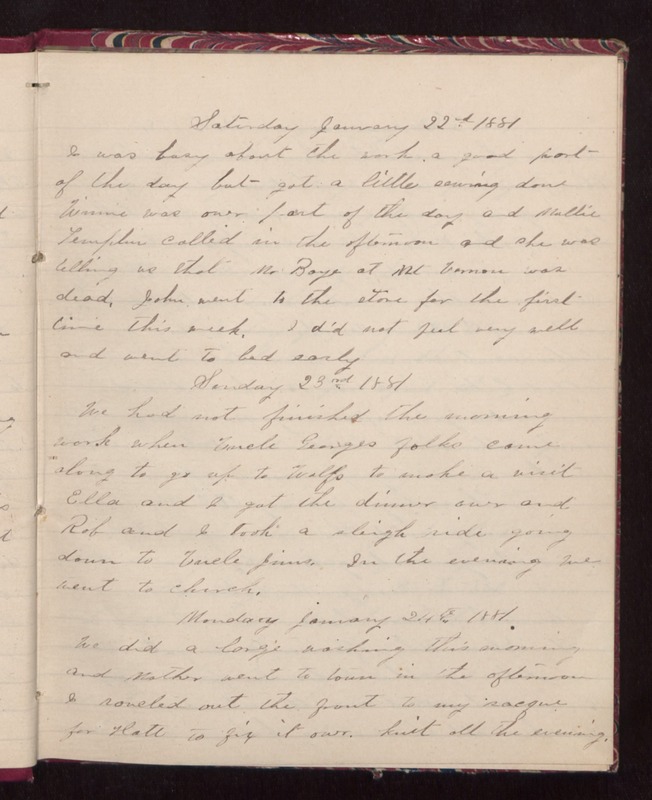 Monday January 24th 1881 We did a large washing this morning and Mother went to town in the afternoon. I raveled out the front to my sacque for Hatt to fix it over. Knit all the evening.